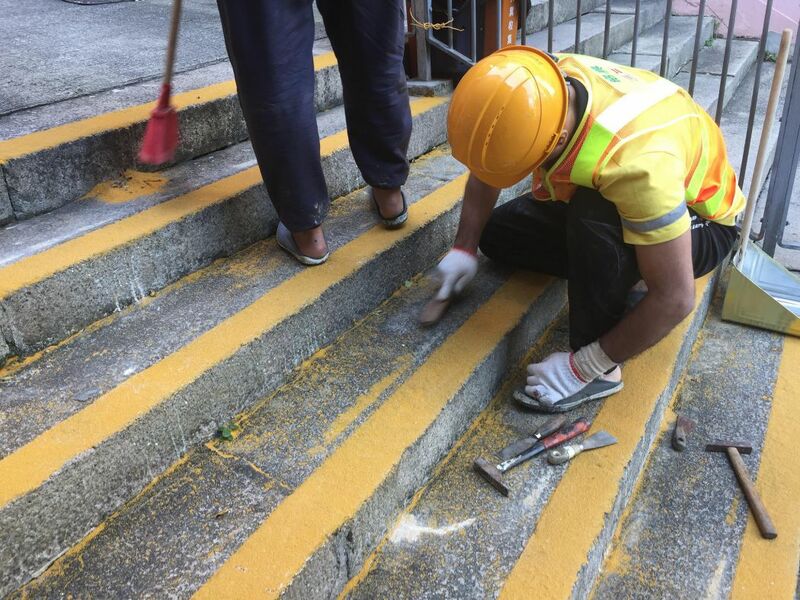 Workers have tidied up yellow non-slip paint on a historic flight of stairs in Sheung Wan after the work was described as “very ugly and unacceptable” by government representatives. The improvement work on Tuesday came after further criticism from lawmakers and conservationists. 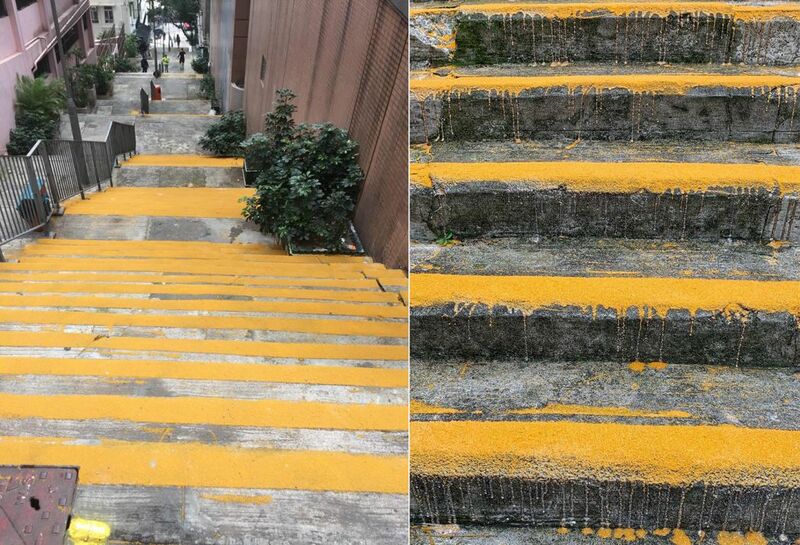 The granite stairs on Shing Wong Street, which are over a century old, were painted late Saturday night without any prior consultation or notice from outsourced workers of the government’s Highways Department. Workers tidying up dripping yellow non-slip paint on Shing Wong Street. Photo: inmediahk.net. After an on-site inspection on Monday, Civic Party lawmaker Tanya Chan quoted Highways Department representatives as saying that they found the quality of the work to be “very ugly and unacceptable.” The department then decided to halt the work. 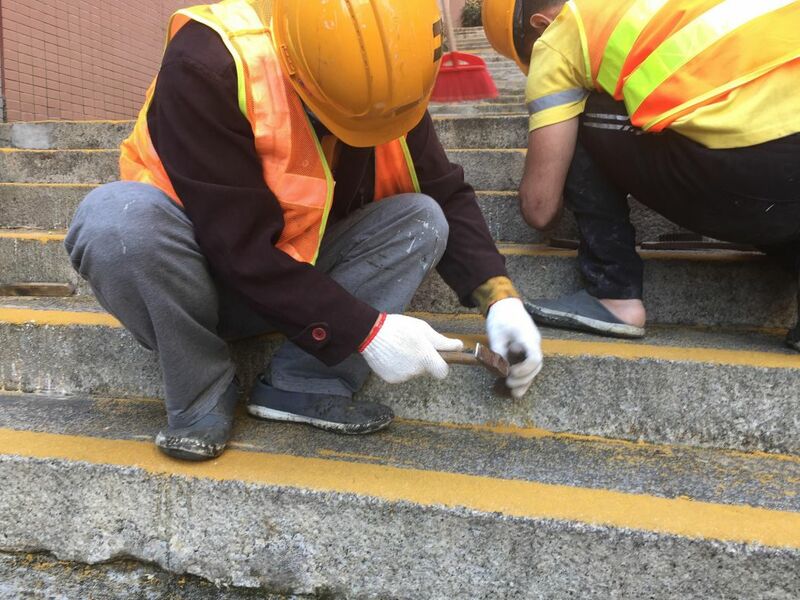 The department’s outsourced workers were sent to the site on Tuesday morning to tidy up the coating, which was loose and dripping down the steps. Shing Wong Street. Photo: Central and Western Concern Group. Katty Law, convener of the conservationist Central and Western Concern Group, also met with the department. She said they will host a joint meeting between her, Tanya Chan, as well as the government’s Antiquities and Monuments Office. Although the stairs are not protected by the Antiquities and Monuments Office, the site is soon to receive a rating from the Antiquities Advisory Board. The board is set to discuss the history of the stairs and pass on suggestions to the office. Law also said the department declined to reveal who suggested conducting the work. 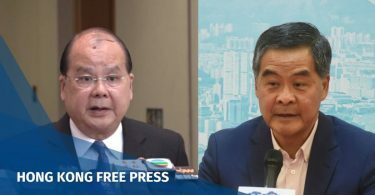 The Central and Western District branch of the Democratic Alliance for the Betterment and Progress of Hong Kong (DAB) party published a video in October suggesting that there were slip hazards in the area. 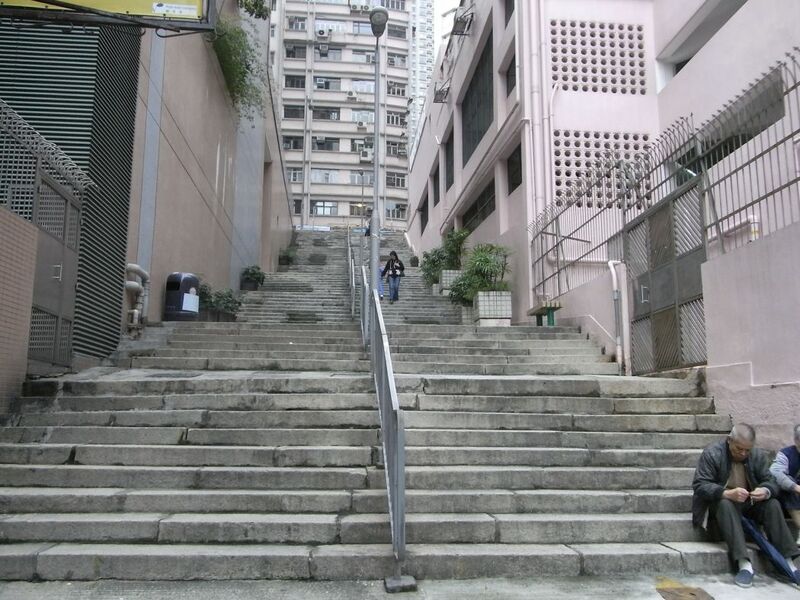 Shing Wong Street before the paint works were conducted. Photo: Wikimedia Commons/Alectesom. On Monday, the branch issued a statement saying that it was “shocked” that the works were conducted without consulting or notifying the District Council and residents. 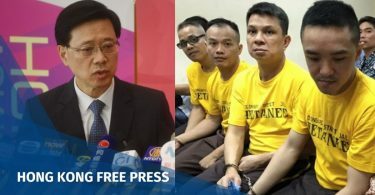 The branch said it expressed anger and disappointment that some media outlets and netizens claimed the party’s district councillors suggested the work, without providing any evidence. “We stress that DAB never made a suggestion to any government department to conduct the aforementioned works, and the Highways Department has clearly explained that the works had nothing to do with DAB,” the statement read.